On the morning of February 1m Richey Manic checked out of the Embassy Hotel in west London. On February 17, his car was found abandoned near the Severn Bridge. Despite a nationwide police search and appeals from family and friends, he remains missing amid growing fears for his safety. 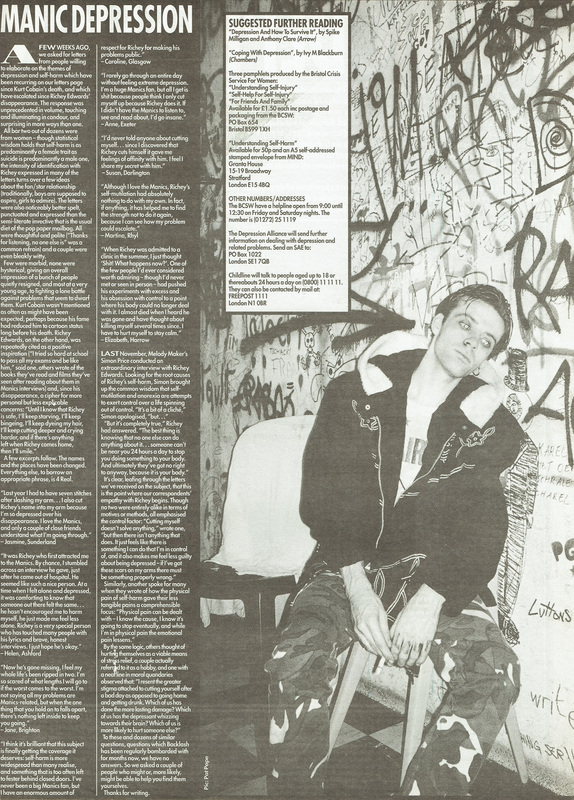 Since MM first published details of his disappearance, we have received an overwhelming number of letters from distressed fans, many of whom have expressed an extraordinary empathy with Richey's well-documented personal problems, which last August saw him hospitalised for treatment of anorexia, alcoholism and depression. For many of these readers, it is clear that Richey's problems all too clearly reflected what they are going through in their own lives. Here, MM's Andrew Mueller writes about his own experience of depression and, overleaf, examines the response of our readers to Richey's continued disappearance. We also hear from consultant clinical psychologist Dr Keith Stoll and Emma Borton of The Samaritans. Reaction to Kurt Cobain's suicide last April and Richey Edwards' disappearance this February is, inevitably, best summed up by one word: why? The tone in which it's asked varies greatly, from appalled grief to sorely tested irritation, but the common denominator is a lack of understanding. Kurt and Richey, both young, beautiful, talented admired, leading lifestyles that the rest of us can only picture through a green haze of envy and both, clearly, desperately unhappy people. How could that be? Fair question. Let's try narrowing the focus a bit. I'll sketch you a portrait of another young man. He's not famous and certainly not rich, but he's healthy, has suffered no spectacular traumas, has ,many good friends, gets on well with his family, has a job which basically involves doing all the things he likes bets anyway - going to gigs, going places, playing records, reading books, watching films, meeting interesting people, doing interesting things - and then writing about it, which is the only thing he enjoys still more. He's got it made, you'd reckon, and you could well be right. Yet, at intermittent, almost random interval, he is deeply, profoundly , even cripplingly miserable, sometimes to the point where he can't see the use in so much as speaking. Making sense to you? Thought not. It doesn't to me either, and I'm him. I was first diagnosed as suffering from severe depression about four years ago, and have been treated irregularly for it since. The initial onset was attributable to one specific event, but while I am now well over that particular occurrence, the fog that settled with it has never, for reasons that remain unclear, entirely lifted. I'm luckier than some: I've never been hospitalised, though it's been a near thing once or twice, I do a job flexible enough to allow me to work around it when necessary, and it's rarely so bad that it renders me completely unable to function, and then not for long. Nor do I consider myself a suicide risk, though I admit to an uncomfortable empathy with the 'logic' of it. This is my attempt to explain what is, for most, the inexplicable. Depression - which isn't the same as being depressed, which happens to everybody - suspends your perspectives, acquires its own impetus, one totally divorced from reality. It's beyond such commonly suggested remedies as pulling your socks up or snapping out of it, which would be like trying to leap free of quicksand. There have been times in the last few years when I've had no job, no home, no clue as to what I was going to do next, a set of personal circumstances that only Jackson Pollock could have mapped, and yet have been happy, content and inspired. By the same token, there have been times when the phone has been abuzz with offers of exciting work, free travel and other inducements to smile annoyingly smugly on the bus, yet I've felt so comprehensively and unshakably - one of the things that distinguishes depression from being depressed is a spiralling conviction that things will never improve - bloody awful about everything and everyone that it feels like my brain is climbing through my skull, trying to escape the deafening, silent screams within. What I'm trying to say, I think, is please try not to judge what you don't know, and try to understand even what you can't. I'm fortunate enough to have someone who does, and it helps. Most importantly, things being as they are, it needs to be stressed that this illness - for that is what it is, and a potentially fat one - is not something to be aspired to. It's a perennially attractive cultural myth, and one recently resurgent, that genius is pain, that the only credible art is that born of suffering. Wrong. True, many artists are messed up. True also that many aren't, and truer still that Britain's psychiatric wards - and thanks Mrs Bottomley, Britain's doorways, railway arches and lion cages - are full of mentally ill people who can't paint, write, sing, tap-dance or pickle dead farm animals. I can also tell you for free that suffering chronic depression (albeit alleviated by what one doctor delightfully described as "manic tendencies") doesn't make me a more insightful, thoughtful, alluring or poetic human being. It just makes me, periodically, a pain in the arse to deal with and less fun to be. It's certainly no aid to writer's block. I feel about my black mists roughly like a professional juggler would feel about sporadic palsy, and the testimony of most suffers concurs. People suffering mental illness who achieve great things should be regarded the same way as people suffering physical illnesses: they success despite, not because of their problem. There's nothing at all wrong with wanting to be like Kurt or Richey - eloquent, charismatic, and glamorous figures both. But it is wrong to want to feel like either of them, and there's a big difference. If you already do feel like either of them, you'll know that. There aren't any easy answers, for sufferer or anyone concerned about one. It's difficult and horrible, a vicious sclerosis of the spirit, and I wouldn't wish it on anybody, least of all myself. The point of doing this feature was to do our small bit towards destigmatising and dealing with depression and related issues like self-mutilation, about which most of the Manics-inspired correspondence we've received has spoken of. For what it's worth, I know that the research and reading I've done in putting this together has helped me, and a lot more than I expected. Knowledge, in this as in everything, is power. A few weeks ago, we asked for letters from people willing to elaborate on the themes of depression and self harm which have been recurring on our letters page since Kurt Cobain's death, and which have escalated since Richey Edwards' disappearance. The response was unprecedented in volume, touching and illuminating in candour, and surprising in more ways than one. All bar two out of dozens were from women - though statistical wisdom holds that self-harm is as predominantly a female trait as suicide is predominantly a mole one, the intensity of identification with Richey expressed in many of the letters turns over a few ideas about the fan/star relationship (traditionally, boys are supposed to aspire, girls to admire). The letters were also noticeably better spelt, punctuated and expressed than the semi-literate invective that is the usual diet of the pop paper mailbag. All were thoughtful and polite ("Thanks for listening, no one else is" was a common refrain) and a couple were even bleakly witty. Few were morbid, none were hysterical, giving an overall impression of a bunch of people quietly resigned, and most at a very young age, to fighting a lone battle against problems that seem to dwarf them. Kurt Cobain wasn't mentioned as often as might have been expected, perhaps because his fame had reduced him to cartoon status long before his death. Richey Edwards, on the other hand, was repeatedly cited as a positive inspiration ("I tried so hard at school to pass all my exams and be like him," said one, others wrote of the books they've read and films they've seen after reading about them in Manics interviews) and, since his disappearance, a cipher for more personal but less explicable concerns: "Until I know that Richey is safe, I'll keep starving, I'll keep bingeing, I'll keep dyeing my hair, I'll keep cutting deeper and crying harder, and if there's anything left when Richey comes home, then I'll smile." A few excerpts follow. The names and the places have been changed. Everything else, to borrow an appropriate phrase, is 4 Real. 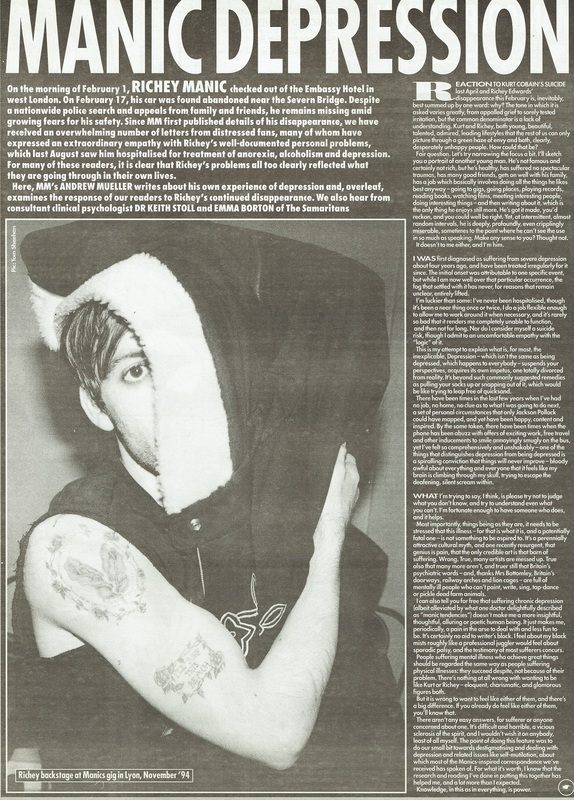 Last November, Melody Maker's Simon Price conducted an extraordinary interview with Richey Edwards. Looking for the root causes of Richey's self-harm, Simon brought up the common wisdom that self-mutilation and anorexia are attempts to exert control over a life spinning out of control. "It's a bit of a cliché," Simon apologised, "but..."
"But it's completely true," Richey had answered. "The best thing is knowing that no one else can do anything about it... someone can't be near you 24 hours a day to stop you doing something to your body. And ultimately they've got no right to anyway, because it is your body." It's clear, leafing through the letters we've received on the subject, that this is the point where our correspondents' empathy with Richey begins. Though no two were entirely alike in terms of motives or methods, all emphasised the control factor: "Cutting myself doesn't solve anything," wrote one, "but then there isn't anything that does. It just feels like there is something I can do that I'm in control of, and it also makes me feel less guilty about being depressed - if I've got these scars on my arms there must be something properly wrong." Similarly, another spoke for many when they wrote of how the physical pain of self-harm gave their less tangible pains a comprehensible focus: "Physical pain can be dealt with - I know the cause, I know it's going to stop eventually, and while I'm in physical pain the emotional pain lessens." By the some logic, others thought of hurting themselves as a viable means of stress relief, a couple actually referred to it as a hobby, and one with a neat line in moral quandaries observed that "I resent the greater stigma attached to cutting yourself after a bad day as opposed to going home and getting drunk. Which of us has done the more lasting damage? Which of us has the depressant whizzing towards their brain? Which of us is more likely to hurt someone else?" To these and dozens of similar questions, questions which Backlash has been regularly bombarded with for months now, we have no answers. So we asked a couple of people who might or, more likely, might be able to help you find them yourselves. Self-harm can become a language of its own when words are beyond reach. But it's a language The Samaritans understand and deal with, writes Emma Borton, the organisation's Publicity Officer . Why do you feel such pain because of Richey Edwards? Why is a musician that significant? Why do you cut yourself too? Why would a young person think of suicide? And, when it happens, when a young person kills themselves, the most terrible "Why?". Because even attempts at an answer are no longer any use. When people can't begin to understand, they ask "Why?" and then swiftly dismiss the cause of their discomfort. It is frustrating beyond measure to have your feelings, in all their intensity, not taken seriously by those around you. Despair doesn't have to stem from something obvious like being binned by a boyfriend or girlfriend or sacked from a job. The sharpest pain may well be felt from the loss of someone you've never met, if that person hos touched something deep within you. For some, the pain of Richey's disappearance is not fading as the weeks pass. Not being able to express such feelings, either because they're not shared by others or because they're just impossible to put into words, adds to the isolation. For some, self-harm becomes its own language when words are beyond reach. Self-inflicted physical pain focuses inexpressible emotional pain. But it is a non-verbal scream that can make others shut their eyes in horror and incomprehension. Don't switch off immediately. Question your assumptions about the Samaritans. If you do make that scary initial contact, you're not going to be told "Snap out of it" or asked "Are you mad?" or told you're over-reacting, attention-seeking, crying for help. However, we may ask you straight, "Are you feeling suicidal?". If you ore, it can be a massive relief to be asked and to be able to admit how unbearable things are, or maybe how much worse they've felt for you since Richey's disappearance. If you confide in a Samaritan that sometimes you gain relief by cutting, scratching or burning yourself, we won't soy "Stop that now" or "What ore you like?" or "That's so weird" or "For God's sake, why?". But we may ask you straight "What are you feeling when you cut your arms? How bad does it feel?". It's a relief to talk and find yourself accepted unconditionally. The Samaritans won't be shocked, because they'll be listening to and accepting the person behind the actions. The Samaritans aren't afraid to talk about taboo things like self-mutilation and suicidal feelings. We can't change your circumstances but we believe that talking really does help. Drop into a branch - Samaritans won't be freaked out by the sight of bandages. You can tell a Samaritan that you're afraid for Richey Edwards, that you can't bear not knowing if he's alive or dead. You won't laughed at or patronised. You won't be judged. We'll listen. We recognise that things can be so bad that people may reach the point where they see no point in going on. Yet exploring these feelings or even just sharing silence can make a difference between choosing life and choosing death. Maybe you can talk to your mates, but sometimes it's easier to talk to a complete stranger, especially if you know that they're not going to dole out advice and that everything you soy will be treated in total confidence. We're not religious and we never intervene without permission. If you don't want the call to appear on an itemised bill, we'll call you back. We don't have BT's Caller Display or Call Return technology, and we don't trace calls. A caller never loses the right to make their own decisions - including the right to take their own life or hang up without a word. Our volunteers come in all shapes and sizes - bikers and musicians included, believe it or not. But even if the one you speak to can't quote Richey's lyrics, they will always take you seriously. Their time is your for as long as you want it. Richey Edwards is important to many people, and the level of feeling that his publicly visible pain and subsequent disappearance has inspired can't be underestimated or dismissed. If it's touched you or you're feeling bad in any way, consider calling The Samaritans. You never know, it could make a difference. We hope that by finding there is someone there, 24 hours a day, to listen to your darkest and most confusing emotions, maybe, just maybe, you con find another way of releasing all those feelings. Consultant Clinical Psychologist Dr Keith Stoll explains what drives people to self-mutilation and the deprivations of anorexia. As a clinical psychologist who has seen self-mutilation and anorexia among my patients, I was impressed by Richey Edwards' clear descriptions of his self-mutilation and of anorexia. To the outside world, self-mutilation and anorexia seem to be incomprehensible. To those carrying out such behaviours, they make perfect sense, and Richey Edwards provided much in the way of information as to what such actions mean to the person carrying them out. Self-mutilation and anorexia do have a lot in common. Even if you don't take into account any deep psychological or analytical explanations for why they occur, some principles are probably straightforward enough. There is no single explanation to account for everybody who carries out the cutting, gouging or burning of self-mutilation, or of the over-control of anorexia. But, for the people that I have seen, there are clear themes that emerge time after time. The actions themselves are often the result of a deep-seated frustration, which doesn't seem to be able to be sorted out in any other way. Sometimes, the act itself can be a release that individuals "save up for". They keep tight control over the rage inside them, only to let out the collection of anger and upset in a self-mutilatory binge, or by depriving themselves via anorexia. For some, the trigger is obvious - the pressure to be somebody different than they want to be. For others, the frustration about not being able to keep themselves (or other people) happy is enough. Others are responding to the fact that those around them sometimes provide them with a moving target- as soon as they come close to the finishing tape, the finishing tape is moved further away. Very often, those who struggle with these difficulties report that these actions provide feelings of control, since they feel that they control so little else in their lives. The opportunity to control your own weight to your own requirements can be an attractive proposition, if that is the only thing that you feel you are in control of, or if you feel that that is the only contribution to appearing attractive that you can make. Similarly, self-mutilation can work in the same way. Patients have pointed out that: "It is my body and I can do what I want. It is my choice." Others report that self-mutilation and anorexia make them feel "real". Richey himself had declared this very clearly. One of my patients said that it was only when she saw the blood coming from the cut that she had evidence she was alive and "real". Without this, she was not quite sure. Perhaps those people who need to be reassured in this way are those people who have coped with their pain by shutting themselves down - and the only time that they release this "shutdown" is when they cut. No matter how illogical it may seem, people who self-mutilate or who are anorexic do not experience as much pain as outsiders would expect. Indeed, man report that they have no pain at all. They re rt that, as e blood emerges from the cut, there are filings of calmness - but not an increase in pain or agitation. Research shows that those people who carry out such difficulties are not kidding themselves when they re rt that it is fairly painless. Instead a the increase in body symptoms which would be predicted with such activity - an increase in sweating, anxiety, heart rate and so on - there seems to be a reduction in these. However, for the huge majority of us such activities are something that we cannot consider, activities that would do nothing to sort out our difficulties. They would make our problems worse. Those who carry out these actions seem to have a specific way of handling themselves and others that makes it possible to follow through on such behaviours. People who have come to me have often asked why, since what they do does not hurt on dy else, what is the problem with continuing? The main difficulty is that self-mutilation and anorexia may appear to be some sort of solution at first, but both quickly become all-powerful. in other words, at first they may be activities of choice, but tall too soon they become insistent and dominating. There is short-term relief. but ultimately the cost becomes very great indeed, and depression is an almost inevitable accompaniment. In the end, the behaviours become the major problem: the individual becomes more anxious and more depressed about the anorexia and self-mutilation and a vicious cycle is set up. Why it is that some people seem to find themselves able or willing to carry out these activities is not clear. Anorexia is perhaps the easier to understand, as during the early stages, at least, there is the obvious gain of appearing slimmer. Offers of help are often rejected, sometimes because the person making the offer is not the right one, sometimes cause it comes at the wrong time, and sometimes because of the pattern itself is so powerful that to give it up produces a feeling of "betrayal: of all the previous episodes of self—mutilation or of food restriction. To change means that a rethink of life is necessary; to change means that there is the suggestion that the person has been somehow "mistaken" in the past; and to change means that risks have to be taken. This last point is very important. The mutilation and food restriction does provide something to the individual doing it — otherwise they would not be carrying out the activity. There is usually a short-term gain. To give it up means that the person is giving up a technique that seems to work, and is facing the prospect of developing a new approach they fear may not be successful. It is a tough job trying to convince people that there are alternative, more effective, permanent and successful ways of handling the difficulties that led to the problem in the first place: developing self~esteem and self-confidence; overcoming the fears of failure and the resentment of control by others; and changing the way they can be in charge of themselves. These are all seen as difficult tasks. Those with the difficulty ask me why they should not stick with what they know and already trust. There is, of course, a problem facing those who have these difficulties when the seek help. There are attitudes from doctors, helpers and, parents based on the idea that "There are enough illnesses and problems that exist that are beyond control - why can’t you stop doing something that you bring on yourself?”. Of course, the answer is quite clear - if the sufferer felt that they could so easily do something about their difficulties in different ways, why would they be using self-mutilation or anorexia as solutions? Further, if the anorexia or self-mutilation is such an appalling difficult action to identify with, why can’t others understand the pain and unhappiness that is so great that it leads to such activities. What can be done? The problem is not that there are not a large number of therapists, psychologists and psychiatrists available who can help. Rather, it sometimes takes a large number of attempts to meet up with the right person who does understand and who will give help which is useful and compassionate. The obvious first choice is the GP. They have access to a large range of people, from whom they can choose the person who might just suit. If not the GP, then anybody of any age can phone The Samaritans, who have probably learnt more about these problems than others. They have had generations of callers who have talked to them about such difficulties. They also have contacts who can help. Specialist counsellors are also available, and so are self-help groups. I advise people to demand personal recommendations from those who have already met up with the professional concerned before going in "blindly". It is the match between the sufferer and the helper that is as important as anything else. All of us who have dealt with such cases have seen success. We have also seen situations which were less than successful. The difference is not in the personality of the individual who is suffering. Rather, it lies in the determination of the individual who comes to see us to take the risk of learning to change. This page was last modified on 15 May 2018, at 09:40.